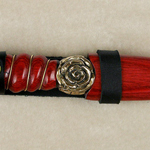 A simple small rose knife. A small rosebud for the pommel and an open rose for the hilt. The leaves of the rose curl back around leaving the back smooth, perfect for a boot or bracer. Each knife is hand-made to your specifications, with many options available.